Each month, as a part of The Recipe Redux (a group of registered dietitians and healthy living bloggers) we create a themed recipe that is made a healthier or lightened-up. This month’s theme is pie, because who doesn’t love to splurge on a delicious slice of pie every now and then?! This lightened-up whipped chocolate toffee pecan pie is made with a heavenly flourless pecan crust. There is no added sugar in this recipe, the sweetness comes from a hint of maple syrup, semi-sweet chocolate chips and chopped up Heath bars. 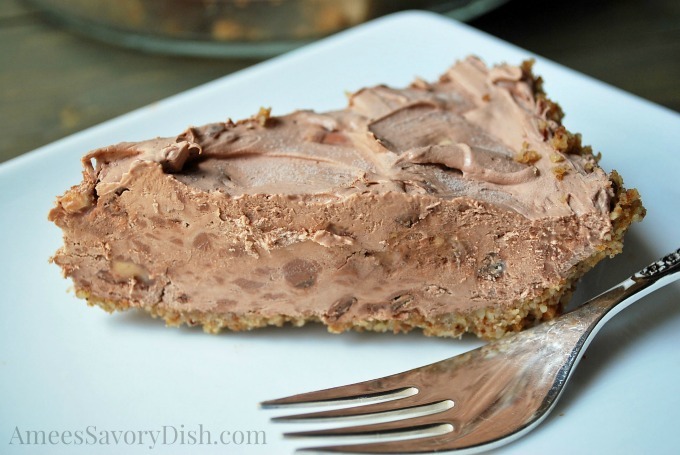 This pie is stored in the freezer, so it’s easy to slice. You get a nice crunch from the Heath bars in every silky, chocolatey bite. So good!! In the bowl of a stand mixer, combine cream cheese, vanilla, half and half, maple syrup and cooled chocolate. Blend until smooth. Stir in Heath bars and fold in whipped topping. Pour into cooled pie crust, cover and freeze for at least 3 hours before slicing (pie should be firm). Store leftover pie in the freezer. 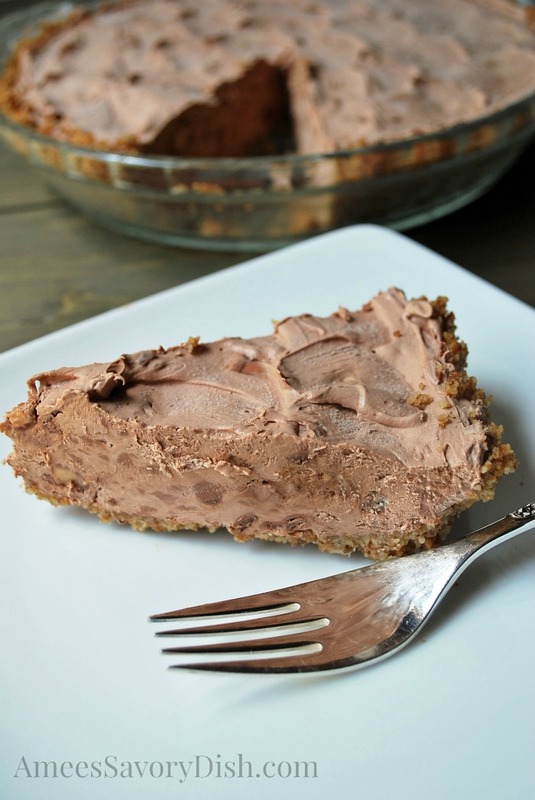 Be sure and check out more pie inspiration from my Recipe Redux friends below! This chilled chocolate toffee pecan pie makes the perfect summertime dessert! I’m seriously drooling over this right now! It can’t get any better than this! Sign me up for a slice of this please! Literally..not one word in this title that I don’t love. This is actually heaven in a pie!